The Seahawks are getting visits this week from free agent kicker Jason Myers and punter Jeff Locke. It’s no surprise that the Seahawks might be getting to work quickly to find potential replacements for place kicker Blair Walsh, who capped a season of struggles with a missed 48-yard field goal in the final minute Sunday that allowed Arizona to escape with a 26-24 win. Walsh played this season on a one-year deal and is now an unrestricted free agent, and after hitting just 21-29 field goals this year, a success rate of 72 percent that ranked 33rd in the NFL this year, it has been expected he won’t return in 2018. What might be more of a surprise is that the Seahawks could also look to replace punter Jon Ryan, who has been with the team since 2008 and has a contract through 2019, but also has a contract that makes him vulnerable to being a salary cap casualty this year. Ryan’s contract calls for cap hits of $3.2 million and $3.6 million the next two seasons with Seattle able to save $2 million and $3 million in those two years by releasing him — Ryan counted as just a $1.6 million cap hit the last two years. And according to a source, the Seahawks are getting visits this week from both a kicker and a punter with NFL experience who are currently street free agents, meaning they were not on a roster when the 2017 season and can be signed now (players who are unrestricted free agents but on rosters when the season ended cannot be signed until the new league year begins on March 14). 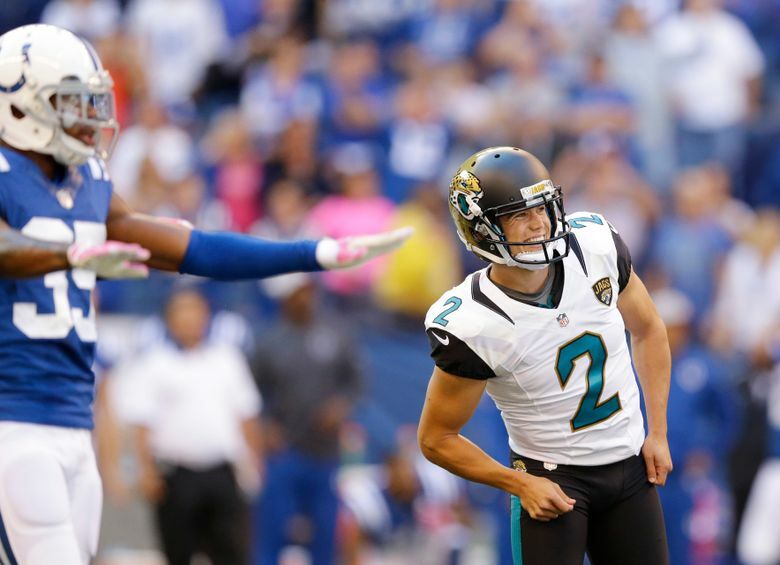 The kicker is Jason Myers, who spent all of the 2015 and 2016 seasons with Jacksonville and the first six games of this year before released following three misses that proved critical in two losses (though all from 52 yards or longer) while the punter is Jeff Locke, who played at UCLA and has been with the Vikings, Colts and Lions in a career that dates to 2013. The 26-year-old Myers, known for his leg strength, was 64-of-79 on field goals (81 percent) and 76-of-88 on point-after attempts (86.4 percent) in 38 games with Jacksonville. Myers has had workouts with the Chargers and Bengals, among others, since his release and would likely come relatively inexpensively. Seattle, though, can also be expected to take a look at a lot of kickers this offseason, and potentially sign more than one to have competition and training camp, after the struggles this season with Walsh, who was the only kicker Seattle had in camp last season after also signing as a street free agent last February after having been released by the Vikings the previous November. Locke, an All-Pac-12 punter as a senior at UCLA in 2012, was a fifth-round pick of, yep, the Vikings, in 2013 and played for Minnesota from 2013-16 before signing with the Colts as a free agent last March. But despite signing a deal that included $1.25 million guaranteed, he was released by the Colts in August after losing the job to Rigoberto Sanchez. He then signed with the Lions as an injury replacement for Sam Martin before being waived after five games when Martin returned. Locke averaged 45.3 yards per punt this year with the Lions with a net average of 42.2 that would have ranked sixth if he had enough attempts to qualify. Players visit all the time, so that Seattle is bringing in Locke could just mean the Seahawks are exploring options just in case. Ryan, though, hasn’t had competition the last two years after signing a four-year, $10 million deal in the spring of 2016 that included $3.4 million guaranteed after becoming an unrestricted free agent. Ryan had a season that was statistically pretty much in line with all of his others with the Seahawks, averaging 45.0 yards per punt with a net of 38.8. But his age —he turned 36 in November — and contract would have Seattle looking at other options (Ryan is also Seattle’s holder on field goals but Locke also has experience as a holder). Ryan is Seattle’s longest-tenured player, joining the team in what was Mike Holmgren’s final year with the Seahawks and is the only player left on the roster who pre-dates the arrival of Pete Carroll in 2010. Ryan has played in 159 straight games, which is a Seahawks’ record, and is the franchise career leader in many punting categories including punts (770), punt yards (34,480) and longest punt (77).